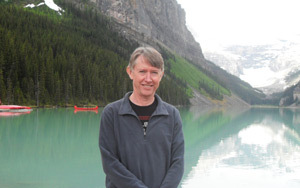 Pannell Discussions » 157 – Is the community an environmental “asset”? » Ideas in economics, environment, policy and more. 157 – Is the community an environmental “asset”? In working with environmental managers and policy makers in the INFFER (Investment Framework for Environmental Resources) project, we aim to get clarity of thinking about investment priorities. A common source of ambiguity is the practice of calling the community an “asset”. In INFFER, we use the term “asset” to refer to the things that the environmental program is ultimately meant to protect or enhance. In other words, they are natural assets, such as rivers, land, vegetation, species or wetlands. However, we strike problems because many people involved in environmental programs like to say that the community is an asset. It is clear enough what they mean – in some situations, we need the community to respond to deliver environmental outcomes, and if we can enhance the capacity of the community to respond, we can enhance the environmental outcomes achieved. It also has elements of respecting and valuing the role of the community in environmental programs. This much is unarguable. The problem is that the term “asset” means something rather different in the two cases (natural assets versus community assets). In the case of natural assets, we’re referring to the outcomes that the program is ultimately meant to achieve. In the case of community assets, we’re talking about something else. The community plays a number of crucial roles in environmental programs, but enhancing community capacity is not, in itself, the purpose of the programs. It’s a means to an end. Roles for the community include the following. (a) The community considers different environmental assets to be of different significance or importance. In INFFER, we capture this in community workshops or draw in information from past workshops or surveys. (c) For some assets, it is primarily up to members of the public to implement the works that would be required to manage the asset. The figure below helps to illustrate how the three roles of the community are quite different from the role of the natural asset. The water tank represents the natural asset. The water level in the tank represents the overall significance of the asset in its current condition. If the asset had been in pristine condition, the tank would have been full. In this example, the asset has been degraded and lost much of its significance. The ongoing degradation process is represented by the open tap (faucet). Works or on-ground actions can be undertaken to reduce the rate of degradation (turn the handle on the tap). It is up to the community (the hand) to do this. The three community roles identified above are labeled in red. Role (a) is that the community’s preferences and values determine the overall significance of the asset. 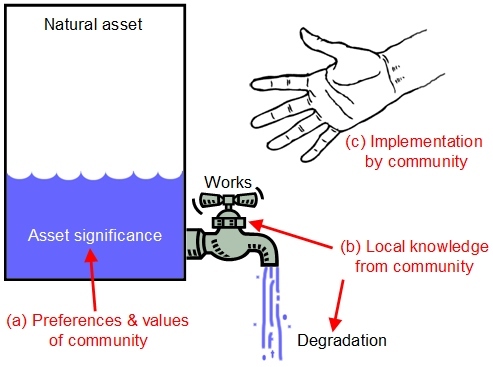 Role (b) is that the community may provide local knowledge about the degradation process or the effectiveness of works. Role (c) is the community implementing the works. In assessing whether an environmental project is worthwhile (one of the aims of INFFER), it is essential to be clear about these different roles and the way they relate to the natural asset. To treat the community as an asset in the same way as a natural asset like a river clearly makes no sense, and would hamper our ability to assess the project properly. The diagram also emphasises that to be able to evaluate proposed actions by the community, you also need to be clear about which natural assets will be affected. If you cannot relate the actions to particular natural assets, you really have no idea about the environmental merits of the project. That is why we prefer to reserve the word “asset” for natural assets. We are not de-valuing the community, just trying to be clear about things. Posted on 14 September, 2009 by David Pannell. This entry was posted in Economics, Environment, Natural resource management, Policy, Politics, Social issues.